Way back in 2010, I went to China alone. I met two co-passengers at the airport who recommended The Red Lantern House in Beijing. The Red Lantern is a very nice place to stay in Beijing, China. This is not a paid post. I just like to share my experience to those people who are looking for a place to stay in China and doesn't know where to stay. This is based on my personal experience and I do not represent the hostel. 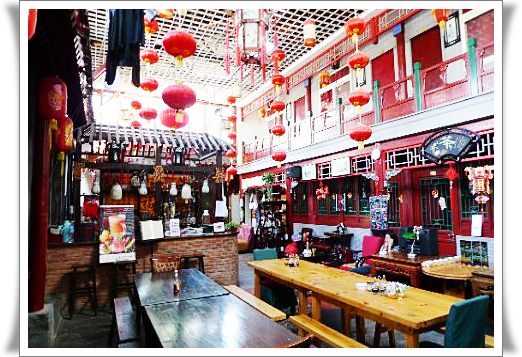 Red Lantern House in Beijing has a great location and I considered it as a great hostel to stay. It has a very clean rooms, with comfortable beds and wifi. I love the peace and quiet atmosphere of the place. You could relax at the sofas located near the reception. I stayed there for 5 days and 4 nights which comes with a free breakfast. At Red Lantern House you get the unique chance to get close to old living styles in Beijing because it is near the Hutongs (typical little street of Beijing). It is approximately 10 minutes to the subway. Subway makes it super easy and cheap to get around Beijing. It is in the middle of restaurants. I enjoyed eating shabu shabu for 14 yuan in Beijing. I went there in November of 2010, it was nearing winter, so a cup of soup feels like heaven to me. The staff was fantastic and very helpful with everything. One particular staff I met is quite good in English. She even lent her map to Temple of Heaven to me and even carried my suitcase and held a taxi for me on my way to the airport. Before I forget, please note that I availed of the one day tour to the Mutianyu section of the Great Wall of China at Red Lantern House, I recommend this to everyone. With super clean rooms, free breakfast and very friendly staff. I'll rate them 4 stars! Excellent Hostel! I would definitely stay at Red Lantern again. Photo from Trip advisor. I still have to find the cd containing my Beijing pictures.